The GRINS group was born from the old robotics and vision research groups from UPC. Actually in GRINS there are researchers from the Robotic and Vision Group of the Biomedical Engineering Research Centre (CREB), and the Institute for Bioengineering of Catalonia (IBEC). The goal of the research group is the study, evaluation and development of robotic systems based on the incorporation of perception capabilities for achieving more flexibility and a more intelligent behavior. Considering the wide scope of the research in this field, the work of the group is oriented to three complementary lines: the design and development of image processing and computer vision systems, specially oriented to control, guidance and supervision of robotic systems; robotic systems adapted to specific environments, and multiagent systems (robots and persons) with cooperation capabilities. The research is focused to problem solving in scientific and technological areas, both in the industrial sector as well as in non industrial environments. At present the main working fields are medical robotics, both surgery and assistance, underwater robotics, mobile robots control, distributed control systems and perception. 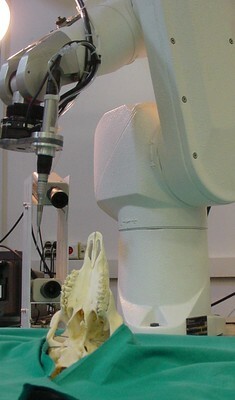 Robotic system for maxilofacial surgery.